Propel your bubble across the United States by practicing deep abdominal breathing. Earn postcards from 102 unique locations as you journey through each state, landing each time in a new location - and a calmer, more focused classroom. Note: Airtime is a GoNoodle Plus game and is only available if you have access to GoNoodle Plus! Learn more about GoNoodle Plus. Calm your classroom and reduce stress. Before a test or presentation. Airtime does not work on mobile devices or tablets at this time. This activity can only be played when using a desktop or laptop computer. Deep abdominal breathing in which the diaphragm fully expands and contracts during breathing floods fresh oxygenated blood throughout the body and to the brain, which can lead to a calmer state of mind. A 2012 study by GoNoodle found that providing students with regular practice in deep abdominal breathing exercises can lower disciplinary events by 37%! Airtime is a stress-release experience your whole class plays together. When playing Airtime, your students will practice a short deep breathing exercise. Each time your class breathes together, they’ll visit a new location on the map and earn a postcard. Visit all 2 locations in all 50 states (plus Washington DC) to earn all 102 postcards! Your grade level: once you’ve selected a grade level, you will not be asked again unless you reset your game. See Resetting Your Game for more information. Your starting location: The first time you play, you’ll choose your state so that your virtual journey starts close to home. Select your state from the list and click Next. 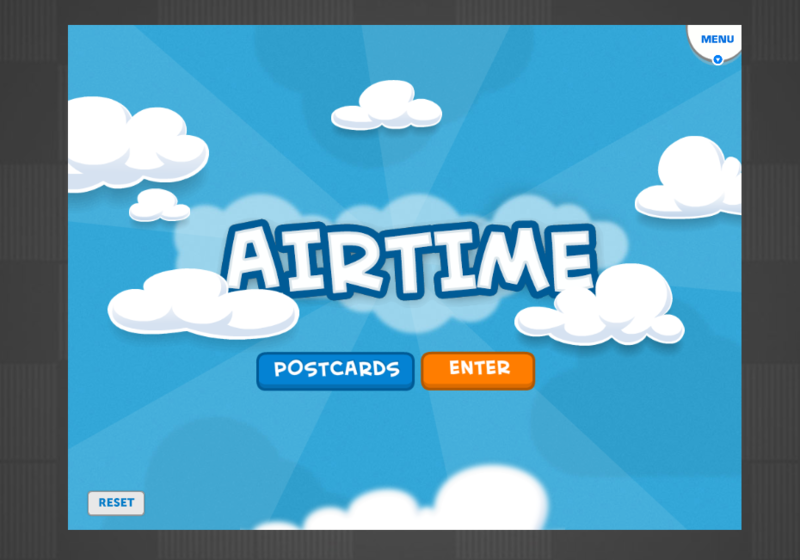 When you open Airtime after your first play, Click Postcards to view the postcards your class has earned so far; see View Your Postcards for more information or click Enter to go to the map and begin your next leg of the journey. After selecting Enter, you are shown the map of your journey so far. The map shows all the locations you’ve visited. Click Go to proceed with a new breathing exercise. 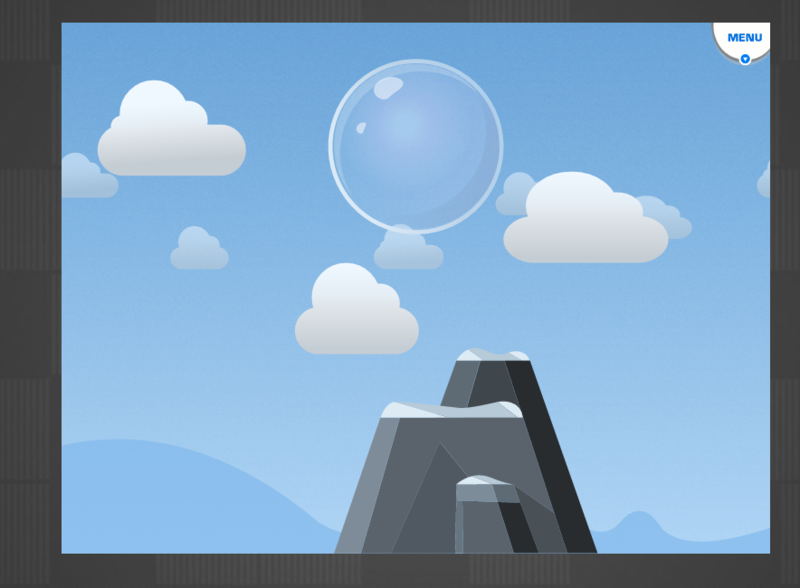 After clicking Go, your class will breathe along with your bubble. The animation and narration will guide your class in the breathing exercise. Make sure the volume is on so all students can hear it. The breathing exercise lasts approximately 2 minutes. When the exercise is over, the video will automatically end. Sit up straight in your chair. Lengthen your spine, or your backbone keeping your feet on the floor and relaxing your shoulders. Place your hands in your lap, with your right hand on top of your left and your thumbs touching. Breathe in and out through your nose. Each time you inhale, try to make your belly inflate like a balloon. Each time you exhale, imagine the balloon deflating. Notice if you are breathing into the top of your chest. If so, try to relax your diaphragm just below your rib cage, or the bones in your chest, and expand your belly. Make sure you are using your breath to expand your belly, and not your muscles. Once the breathing exercise has ended, your class will automatically earn a postcard. Click Flip to view the back of the postcard. Read or share the fun facts on the postcard back with the class. Click Print to print a physical version of the postcard to hang in your classroom or give to students, if you wish. When you’re finished viewing the postcards, click Close. 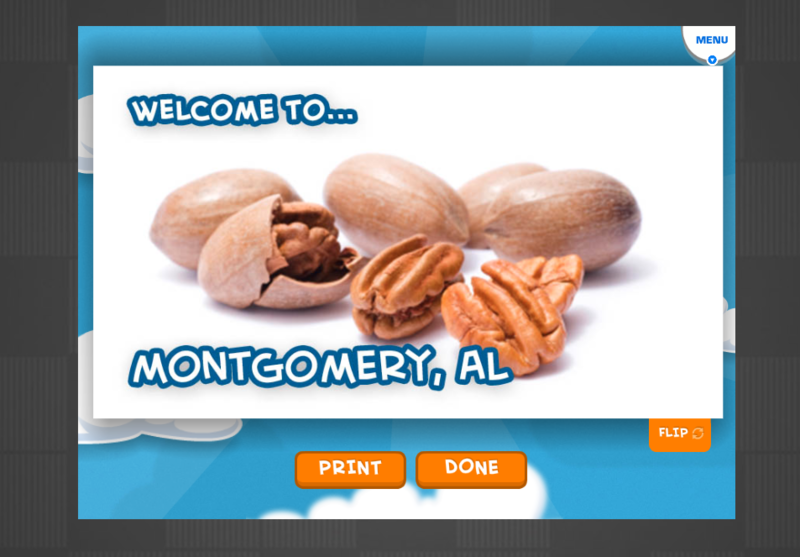 You may click Postcards on the main screen to view your postcard collection. Select a state from the list to see the postcards you’ve earned in that state. Click Print to print a physical version of the postcard to hang in your classroom or give to students, if you wish. If you want to delete your progress in Airtime and start over, click Reset on the main screen of the game. A message will ask you to confirm your decision. Note: Resetting your game cannot be undone! When you reset, you delete all your progress and start the game as if you were playing it for the first time. If you’re in fullscreen mode, click the ESC key on your keyboard or click the exit fullscreen button under the settings menu in the top right. Then, click Close to leave the game.